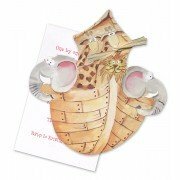 This fabulous invitation in shape of a Noah's Ark is perfect for any baby or child's event. Your .. 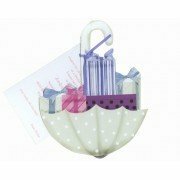 This invitation is the shape of an umbrella is perfect for any kind of shower. Yo.. This invitation in shape a baby bag is perfect for either a boy or girl baby shower. You party in.. This fabulous invitation in shape of crib is perfect for either a boy or girl baby shower. Y.. This die cut of the baby booties and is perfect for either a boy or girl baby shower. You party i.. This die cut of the baby carriage is perfect for either a boy or girl baby shower. You party info.. 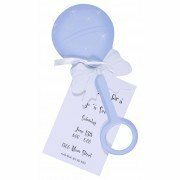 This baby shower invitation in shape of a rattle is perfect for a boy baby shower. You party info.. 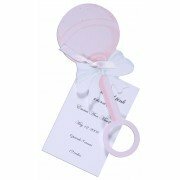 This baby shower invitation in shape of a pink rattle is perfect for a girl baby shower. Your par.. This baby shower invitation in shape of a onesie is decorated with small sailboats and is perfect.. 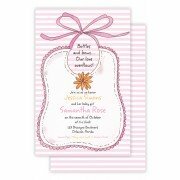 This baby shower invitation in shape of a pink onesie is perfect for a girl baby shower or f.. 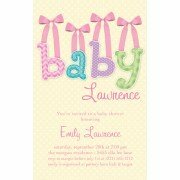 This baby shower invitation in shape of baby blocks spelling the word "baby" is perfect for eithe..
5.75" x 8.75" Girl Baby Shower Invitations. White envelopes included .. 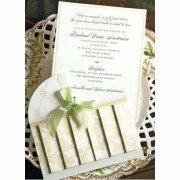 This stunning two piece invitation features a beautifully detailed bassinet with a green bo..
6" x 8" girl baby shower invitation, White envelopes included ..
6" x 8" baby boy shower invitations. White envelopes included ..